a brief talk regarding my creative work. There was an audio-visual presentation using a slide projector where I've shown images of paintings and newspaper editorial drawings; after which I did a solo performance using various modern and primitive instruments. I've posted the studio mix version at YouTube entitled Man, Music and Machine 1. (Thanks to Mario Aldeguer for use of his photos taken that night). are artists, writers and filmmakers. designed to grasp something that it won't instinctively let go of. creativity in every thinking soul. Machine; and also a floating guitar pick-up I've used in an unorthodox way, albeit representing Man's Improvisation. 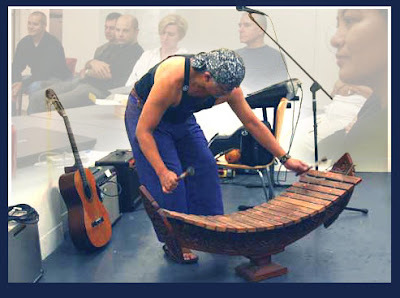 There's also a small but energetic African kalimba (a thumb piano); and the solemn tones of a Malay wooden xylophone. Also an acoustic guitar which shall sound unusual when I use the floating guitar pick-up as slide. In my younger days I often play my blues harmonica which earned a lot of friendship. I'll try to give it a special part in the performance, representing the wind that blows over mankind's fate. It's my heartfelt desire to label each sound of each string representative of Man's professional specialties yet being prolific in nature; and the inherent desire to balance things much so like water seeking its own level. However there are ambiguous oddities which create gaps in the continuity. That is probably to let us breathe, that gap or the silent gaps in between musical notes are vital heartbeats for life's continuity itself. I paint a lot, and sometimes more often than not translate the colours into sound. I assign a sound to each colour. If I play the chords E-G#-A-B-D; I paint E representing Yellow, G# Green, and so on. My painting seems to sing when it's done as I remember the mental processes involved and they mean a lot to me, forever etched in my psyche. Tonight I'll try my best to perform solo using the aforementioned instruments for the Blacktown Artists' Network. I hope to encourage the audience in meditative silence, tolerating technical errors which shall be part of the spontaneity of the whole thing.